Armed with Merrill's cunning, Genie's strength and Melissa's prayers, this all-female band has no trouble raiding ancient ruins - unless a magic seal blocks the way. As an investment, the girls decide to hire a magician. Any magician. Alas, all of the available magicians prefer reading to raiding-except Louie. Swallowing their pride (and several pints), the girls take on the loud, brash novice. In return, the hapless Louie gives them all the adventure they can handle - and then some! 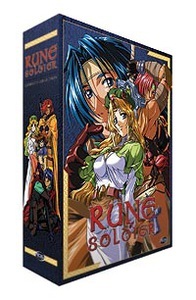 Contains all six volumes of Rune Soldier. DVD Features: Clean Opening and Closing Animations, Character Artwork, Production Artwork, Previews.